Model SFF21G. 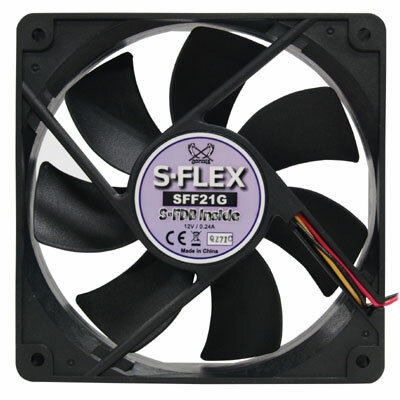 This fan is equipped with genuine S-FDB (SONY Fluid Dynamic Bearing). 1900rpm Version: 75.0 / 35.0dBA / DC12V / 0.24A. S-FDB technology drastically eliminates the friction between the bearing and the shaft which makes this fan nearly inaudible to human ears. Additional suction magnet optimizes the magnetic force balance within the rotor to achieve the absolute silence. To further achieve the absolute silence, the fan is equipped with the Linear drive IC for reducing electromagnetic noise. Patent Pending "S-FDB" structure allows the fan to last up to 150000 hours. Conventional ball bearing carries a point contacting structure for the rotation, which gives point supporting situations at dropping impact to damage ball bearing surface which could cause irregular noises. The S-FDB carries a surface contact mechanism for improved anti-shock structure, which is 5 times stronger than the conventional ball bearing.